Ever the pragmatist, I declined, opting to stay behind and study for an upcoming exam. I’m a nerd, I know. I had the foresight to realize that my tastes were ever-changing. I didn’t want a permanent mark on my body—picked out in a moment of my youth—only to realize I hated it 5 or 10 years later. I was broke. Paying my way through college (with minimal student loans) meant that I rarely had the money to go out to dinner or to the movies with my friends throughout my college years…and I most certainly didn’t have the kind of money a tattoo would cost. But there was one thing that did not cross my mind at the time:the health implications of tattoos. I never considered the short-term (or longterm) consequences of getting a tattoo. I guess that’s not surprising since during that period of my life, I wasn’t particularly concerned with healthy living. While it’s important to consider both the wisdom of getting a tattoo from a faith-based and cultural perspective, it’s also important to consider it from a health standpoint as well. Given that over 20% of Americans have a tattoo, it’s wise to spend some time learning more about the health implications of tattoos. People don’t talk much about what might be going wrong with their tattoo. Some keep their tattoos under wraps, and others that like to show of their tattoos any chance they get. But problems with tattoos are very real. It’s interesting to note that while the FDA regulates many of the things we put on our skin, they don’t regulate the inks that are being injected into our skin. Think about this: many of the inks used for tattoos are industrial-grade. They’re suitable inks for printers and automobiles. That’s some heavy duty stuff. The European Union has been more aggressive when it comes to risk assessment of tattoo inks. Currently over 20 different inks from the US are banned in the EU and have been labeled as too dangerous to use. How can tattoos go wrong? What are some of the health implications to consider when you’re thinking about getting a tattoo? Tattoos are a puncture wounds filled with ink. These thousands of puncture wounds can easily open the door to infection, not just the day you get a tattoo but during the aftermath while your body is healing. Your skin is the first line of defense your body has against invading microorganisms. When you create many puncture wounds, you’ve created a ripe opportunity for acute infection to take place. The hygiene practices of the tattoo artist – Be sure they wash their hands before and after and also wear gloves. The environment of the tattoo parlor, beyond just using sterile needles – Do they keep their work areas clean and sterile? Ongoing care for your tattoo – Do you know how to keep your tattoo clean during the healing process. While it’s true that non-sterile needles are the most likely cause of chronic infection (Hepatitis C, syphilis, staph, etc) from tattoos, they aren’t the only culprit. Even when a tattoo parlor has rigorous standards when it comes to using single-use sterilized needles, there are other factors to consider. Use of non-sterile water for mixing and dilution of tattoo inks can cause infections. Beyond the needles and water, the ink itself can be contaminated with microorganisms including bacteria and mold. These microorganisms may be introduced in the manufacturing process or at the tattoo parlor itself. According to a meta-analysis of 83 studies published in the International Journal of Infectious Diseases, the more tattoos a person has, the greater risk they have of contracting Hepatits C and other blood-borne infections. In fact, according to this research, if you don’t use injection drugs, your odds of having the virus are 6 times as high if you have a tattoo than if you don’t. Other research shows tattoos are the cause of approximately 41% of all hepatitis C cases whereas injection drug is associated with just 17% of all cases. We’re not talking about DIY tattoos or tattoos done in prison, but tattoos from commercial tattoo parlors. Over 10% of individuals who receive a tattoo have an adverse reaction. Think about that for a moment. One in ten people who receive a tattoo will have some sort of negative reaction to the pigments used in tattoos. In recent studies, it shows that in 4% of individuals the reaction was acute—meaning the problems lasted just 4 months or less. But for the other 6%, it turned into a chronic, long-lasting problem. While an allergic reaction to a tattoo might be caused by any number of additives, the most common culprits are metals put into the pigments (nickel, mercury, cadmium sulfite, lead, lithium, and copper). Depending on the ink, there could be other offenders as well. And to further complicate matters, it seems that sometimes reactions are delayed. Often individuals don’t react to the first tattoo, but the second or third tattoo. And sometimes they don’t have a reaction right away or even in the first month of having the tattoo, but years later. Reactions aren’t always just localized to the site of the tattoo, but can cause problems over large portions of the body. Phototoxicity is a chemically-induced skin irritation. When certain chemicals in the body react with the sun, it can cause an exaggerated sunburn-type of response. This often includes a reddening of the area, blistering, and a burning sensation. When it comes to tattoos, it’s the cadmium sulfide which is most often to blame. Yellow pigments are those that have the highest concentration of cadmium sulfide and thus tend to be the most problematic, but some red pigments also contain cadmium sulfide. While fairly mild in comparison to some of the other potential side effects of tattoos, MRIs can pose a bit of a challenge when you have tattoos. MRIs are giant magnets that use radio frequency to find tumors and other abnormalities in the human body. When tattoo ink uses metallic pigments that are also magnetic, this can cause the pigments to pick up more energy during the course of the MRI. When this happens, individuals can experience a first-degree, or in very rare cases, second-degree burns. Tattoos that seem to be the most problematic are red pigments and those with iron in them. While the research on tattoos’ link to cancer is tenuous, there is certainly some evidence that might be worth considering. Many inks used in tattoos could at least increase the risk of different types of cancer. There are a number of ink ingredients that are considered “possibly carcinogenic” like carbon black. And there are a number of ingredients that are “known carcinogens” like benzo(a)pyrene you’ll find in some tattoo pigments. Benzo(a)pyrene is a chemical used in black tattoo ink—found originally in coal tar—and it is listed as a carcinogen by the International Agency for Research on Cancer (IARC). A study issued by the Australian government revealed that chemical compounds known to cause cancer were contained in 22% of tattoo inks they tested. Beyond just the cancer question, we know tattoo particles can increase the toxic load on the body. Nanoparticles from tattoo dyes have been shown to move away from the skin and enter the blood. These particles eventually build up in the spleen and kidneys. The spleen and kidneys are both vital organs important to cleansing the body. The added toxic load of tattoo dyes can put these organs at risk of damage. Does the tattoo parlor use inks banned in other countries or ingredients that are particularly problematic (this may be difficult to find out)? Does the tattoo parlor use inks that have ingredients considered carcinogenic? Does the tattoo artist wash his or her hands before and after creating a tattoo? Wear gloves? Keep the work area sterile? Do they only use their sterile needles one time and then dispose of them? Does the tattoo parlor use sterile water for mixing and diluting tattoo inks? Do you know how to keep your tattoo clean during the healing process? Individuals often think of tattoos simply as a fun way to express themselves, but with every tattoo you get there are always risks. 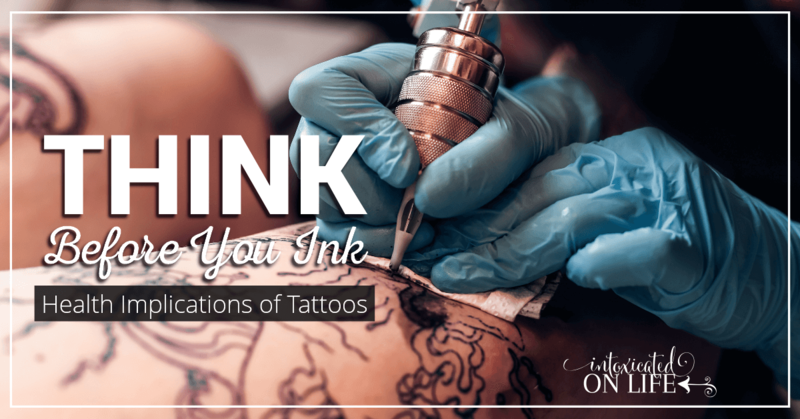 Whether you are considering your first tattoo or your fiftieth, think before you ink. It’s back! 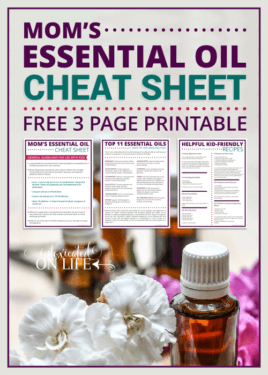 For a limited time you can grab The Ultimate Homemaking Bundle. 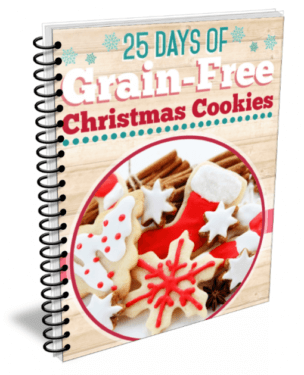 $2,000 in resources to help make dinnertime easier, homemaking hacks to make your day run smoother, and encouragement for your weary day – all for less than $30. Don’t wait, the sale ends on May 1st! Sharing at The Modest Mom Blog, Raising Homemakers, Saving 4 Six, and Pam’s Party & Practical Tips. As a person who has a lot of medicinal and food allergies and sensitivities, I know that tattoos would be out of the question for me (and my body). I would caution anyone thinking about getting a tattoo that already has severe allergies to anything. All of my allergies developed as an adult, and what stated with 1 allergy at age 20, is now 5 at age 39. 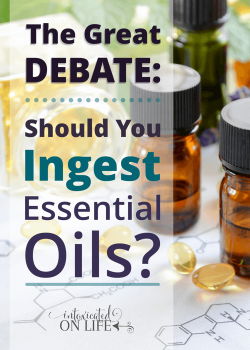 This article answered a lot of questions that I had about the ingredients in the inks that are used, thanks! Yes, because we can’t be certain of what exactly is in the tattoo inks, this could be very problematic for people already dealing with allergies or chronic diseases. When your body is already under a lot of stress adding additional stress of managing the toxic load from the ink in the tattoo wouldn’t be a good idea. Wow! 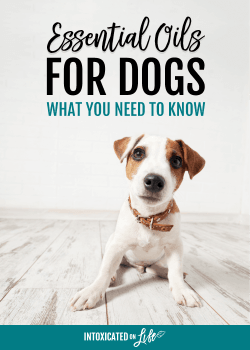 This is great info! Sharing!! Great info. I’ll be sharing this. Wow, this was very informative! Tattoos have never been my thing, although I’ve entertained the idea a few times. I know for sure I would never have considered most of these heatlh implications. 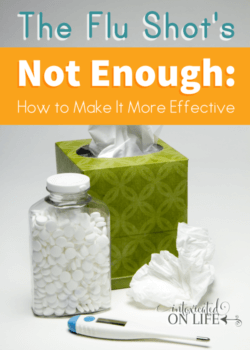 I deal with so many health issues, I don’t need more toxic burden to deal with. Tattoos will now go on my “never” list. 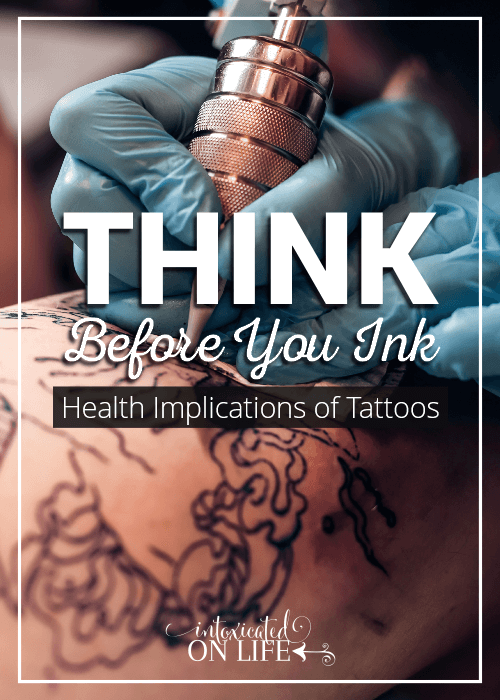 I think this info is especially good for those who already have health issues – people with chronic diseases really need to be aware of the toxic load a tattoo can place on their body. The Red Cross tells people to wait 12 months after a tattoo if the tattoo was applied in a state that does not regulate tattoo facilities—this is because of the risk of hepatitis.